What a BEAUTIFUL PHOTO!! I love your username :) My sister has a Hippo Therapy business for disabled and autistic children called Equessence. Your photos are stunning! Beautiful image. I love it just the way it is. Good start here, Kate! Keep up the good work. If the white horse and the snow against the dark ground were not so compelling (the modeling and colouring on the horse is perfect), I would not bother to add to the misgivings about the foreground, and very much regret I don't know what to suggest to improve it. Very good but I can't help but feeling if you had more of the horse, much more, and less of the foreground this would be great. 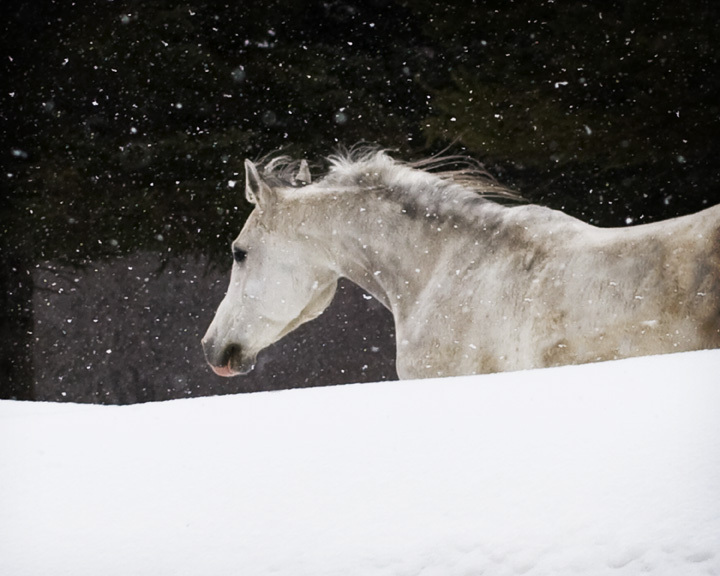 While the almost totally blown snow in front distracts a bit, the composition of the horse with the falling snow adds a dreamy, almost fairy-tale effect for me. Very nice. The snowbank here is really taking so much away from your subject, I really want to see this horse bounding through the snow! neat image, good example of a harsh environment, 7. A bit much snow, but gorgeous horse and snow! Proudly hosted by Sargasso Networks. Current Server Time: 04/23/2019 04:16:39 PM EDT.